This post is to tell you that, well, I have nothing to post. You see, I made this beautiful popcorn...Perfecto Popcorn, to be exact...and blogged about how to make fool-proof stovetop popcorn over on Bake at 350 Goes Savory. So until next time, my friends...I leave you with plain popcorn. And ya know, I think that's how I like it best anyway. Did you bake anything over the weekend? Plain popcorn is a fabulous treat! No baking in our kitchen over the weekend...quite a few Costco treats though! ha ha at least your honest,I baked blueberry muffins..yum! You crack me up! I baked banana bread with bourbon and chocolate chips and my husband made morning buns with loads of Irish butter. It was a splurge but oh so worth it. I was more active in the kitchen this weekend than I've been in awhile. I made Shortcut Apple Danishes (from The Country Cook) for breakfast yesterday and then made Jello Cookies (from iheartnaptime). The danishes were delicious, wish I could say the same for the jello cookies. :( At least they looked pretty in orange, green, red, and purple! I made snickerdoodle blondies from crepesofwrath.net which were a hit at the Memorial Day bbq. I have done a few of those non post posts. I made a Punk Hello Kitty cake for a 14th birthday and a lot of sugar cookies. Lots of baking and cooking this weekend. Only, the baking was all savory--stuffed sweet potatoes. YUM! On the sweet side, I canned fresh rhubarb strawberry jam (so yummy!) and fresh apricot jam. Got to can while the fruit is in season and at its peak. Then I have a bit of sunshine during the long dreary winters. Popcorn is my favorite snack after a day of baking and decorating! Salty is perfect after sweet, ya know? I *did* bake this weekend! I made a red-white-and-blue layer cake (NINE layers!) for my family for Memorial Day. :) Delish! I made a chocolate chip cookie pie with my littles. And it was soooo good. Haven't had popcorn in eons. I think it's about time! I did indeed! I baked enough for the both of us! No worries. This post actually reminded me of the popcorn I have in my cupboard! I also have some "ladyfinger" popcorn that is so itty bitty! It has almost no hulls so it is good for kiddies, and older people! But everyone can enjoy it. I think I am going to go pop some right now! 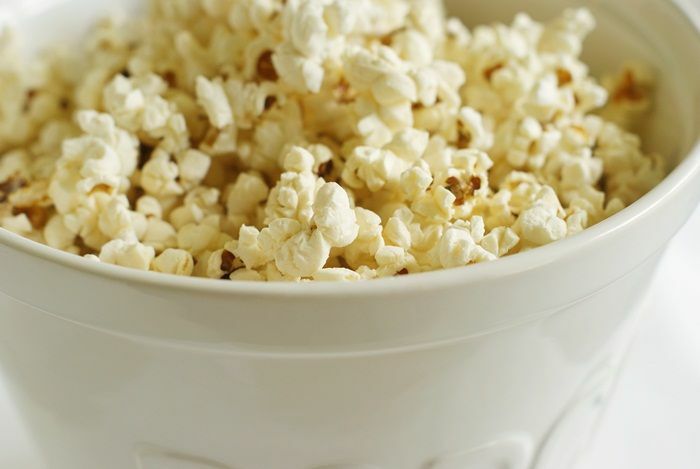 Love simple and plain popcorn! Lately I've been popping popcorn (on stovetop! ), salting it, and then throwing in a few tablespoons of semi-sweet chocolate chips. Totally hits the salty-sweet and chocolate spot. The chocolate melts as I toss it all around in the bowl.